SolHenge retreat space in Aquitaine France is a stunning and private paradise with a farmhouse that sleeps up to 17 people and glamping accommodation which sleeps up to 8. 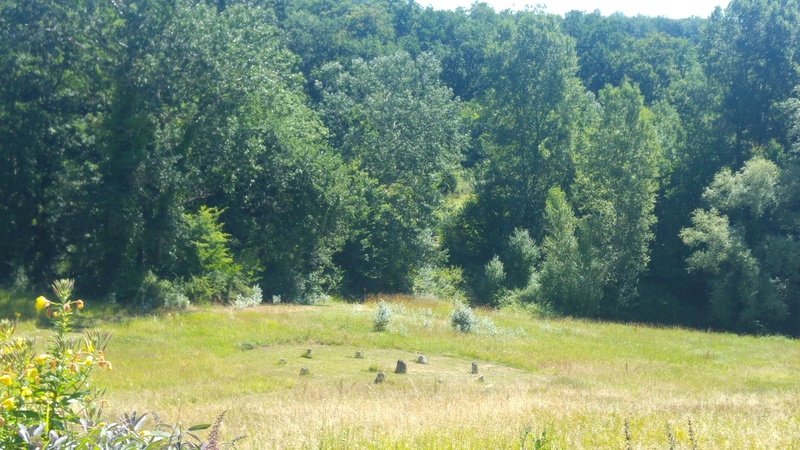 Surrounded by rolling hills filled with sunflowers and vines, it boasts a secret valley which is totally secluded, 15 acres of private woodland, a swimming pool, fire pit, stunning hill top views and our very own SolHenge stone circle. We are only one hour from both Bergerac and Bordeaux Airports. During your time with us the central barn space of over 110m2 is perfect for your communal learning work. Next to this is another large terraced area with comfy seating. Healthy vegetarian food (with vegan and wheat free options) is offered to you, alfresco at long tables under the trees enjoying the views over our valley. Each of our bedrooms and the glamping is designed for comfort and we can configue them to your clients individual needs. There is also a beautiful sitting room and kitchen for students. Private Shamanic Healing, massage sessions and even a ceremony can be organised for your stay to compliment your teachings. We offer additional nights bed and breakfast either side of each retreat so that your clients can land and integrate their learning before heading back into their daily lives. We also offer discounted airport collections and are happy to organize the logistics of this so you don’t have to! We love to work with like minded individuals, so if our land is calling you then please just be in touch.